“Fruit Jar with Lid” and “Bouquet, Sm.” were stamped on white card stock, colored with chalk and pencils and cut out. 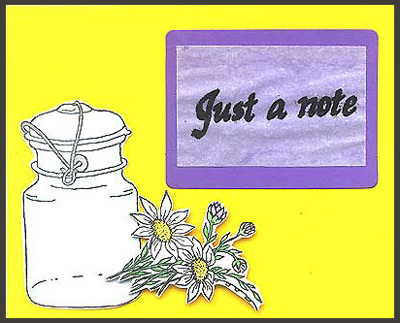 “Just a Note” was embossed in black on a piece of vellum cut in a rectangle and then mounted on a rectangle with rounded corners cut from lavender card stock. The jar and, “Just a Note” were glued to the yellow card stock and the bouquet was mounted on foam dots. Card by Anaka Kagen.